Drivers, as frontline workers, are a motor carrier's first line of defense against poor safety data. It takes two years before one crash or one unfavorable roadside inspection is removed from the data used to calculate a company's Compliance, Safety, Accountability (CSA) BASIC scores. 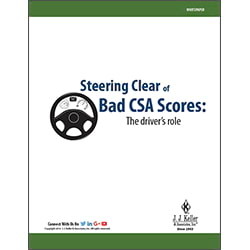 This whitepaper offers some practical tips for drivers on how to assist their company in lowering CSA BASIC scores. Checklists — tailored to fit the driver's role — are provided at the end of the document to promote discussion and offer some basic recordkeeping reminders. Fill out the form to download your FREE whitepaper - CSA and the Driver.